Mexican-Style Three Bean Salad Recipe | Healthy Vegan Salad in 15 Minutes! 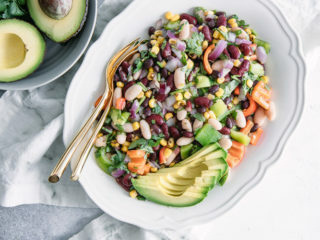 Mexican Three Bean Salad, a simple vegan bean salad featuring black beans, kidney beans, and white beans. Mixed with corn, avocado, and cilantro, this cold salad is easy and delicious! Are you a fan of salads made from pulses? Who doesn’t love an easy salad that is ready in fifteen minutes and can be eaten for lunches throughout the week? Here at Fork in the Road we LOVE simple vegan salads made from beans, chickpeas, lentils, and other pulses. Whether it’s a simple lentil bowl with a sunny egg on top or a plant-based roasted chickpea and grain salad, whipping up a big salad bowl from plant-based proteins is our go-to Sunday solution for a busy week. One of our favorite easy bean salads is this Mexican Three Bean Salad. 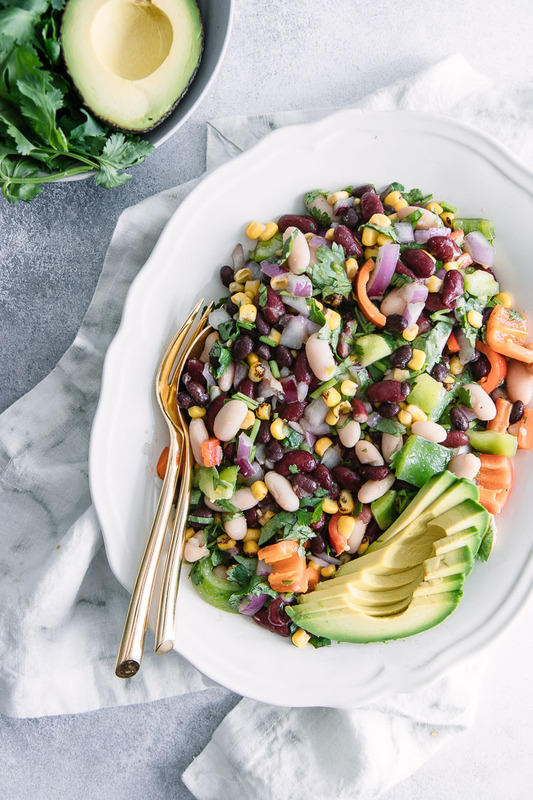 Made from black beans, kidney beans, and white beans, this fiesta-inspired pulse salad is one of our favorite easy recipes to make once and eat all week. With peppers, onion, corn, avocado, and a bold cilantro, cumin, and chili powder dressing, it’s sure to become a staple salad in your house too. Ready to learn how to whip up this easy vegan bean salad? Let’s do it! 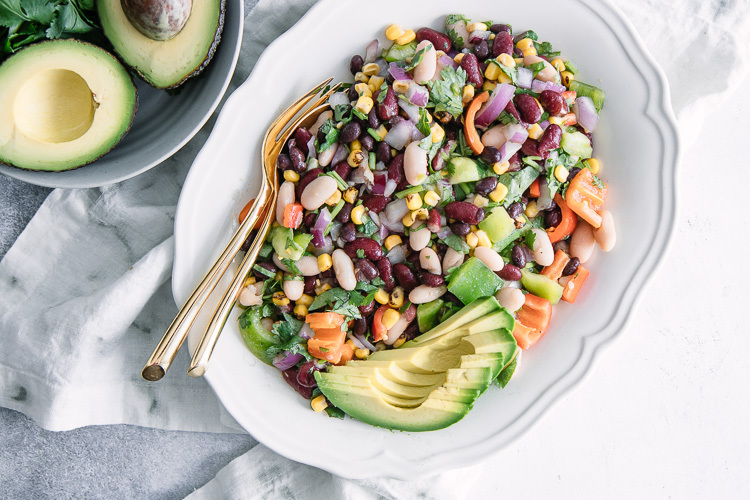 Bean salads are typically made by mixing together an assortment of beans with additional vegetable ingredients like green peppers, green beans, grilled corn, tomatoes, avocados, and a simple dressing with herbs. The salad is tossed and then served immediately or can be refrigerated and served colds, as bean salads are great for leftovers. 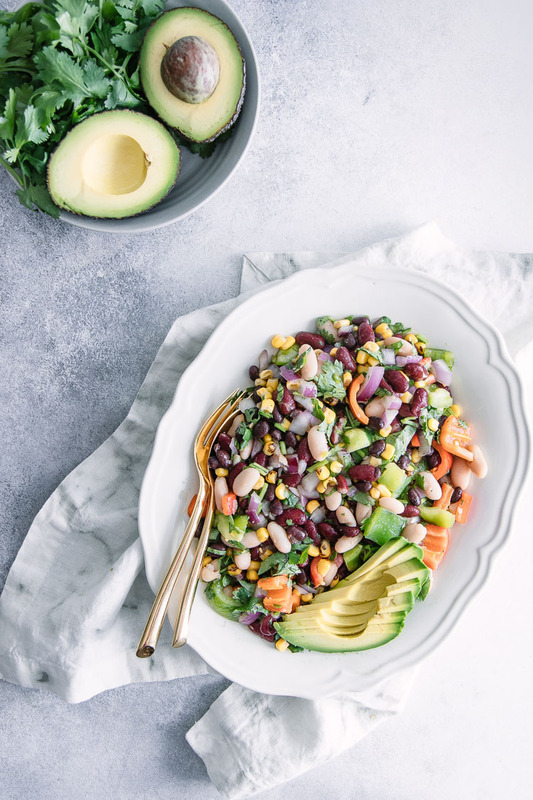 A bean salad can be served as a main dish, a side dish with meat, fish, or grilled vegetables, or even as an appetizer chunky salsa with chips and other dips (like our favorite superfood Vegan Green Goddess Avocado Dip). Should you use canned or dried beans for a bean salad? Both dried or canned beans can be used in bean salads. Dried beans require soaking anywhere from a few hours to overnight and then boiling to achieve the soft texture of canned beans, so the total cooking time will be longer for dried beans. However, if you know you will be making a bean salad in the future then soaking and preparing beans can be done days ahead of time by storing beans until you’re ready to use them. Dried beans can be bought in bulk and therefore end up being a more cost effective way to stock up on beans. Alternatively, you can use canned beans for an easy “open and drain” bean preparation. I often end up just buying canned beans because it is much easier and requires no prep time to make this Mexican Three Bean Salad, however I always buy low or no sodium beans and make sure to rinse them before using to get rid of extra salt. What dressings go well with a Mexican Three Bean Salad? 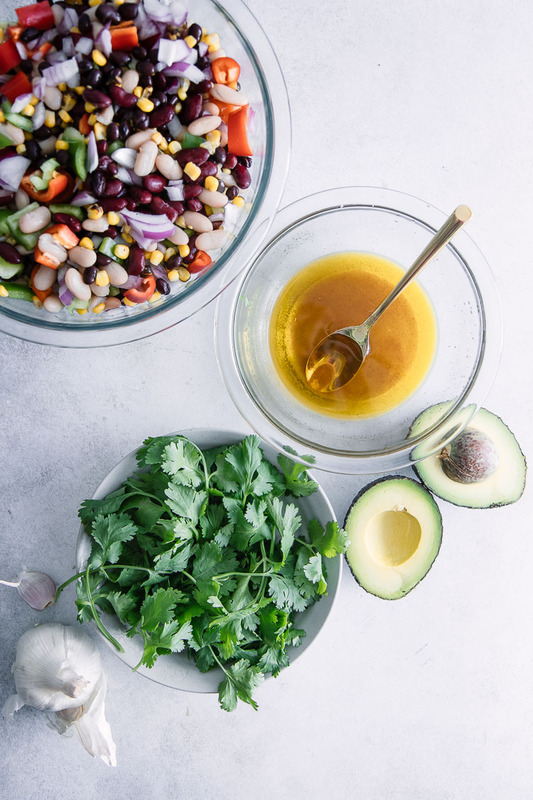 Any light oil-based dressing is a great choice for bean salads, like the olive oil and herb dressing used in the recipe below. If you like a creamier dressing, skip the dairy and blend half an avocado to your dressing for a creamy and richer dressing consistency. This easy Mexican-style vegan bean salad does not require cooking or specific tools, however there a few kitchen essentials will make whipping up this bean salad easier. First, a good set of quality glass mixing bowls is necessary when tossing large salads with lots of ingredients and also double as salad storage. And finally, I also recommend investing in a good quality knife set and a quality cutting board. If you’ve ever tried cutting a pound of vegetables with a bad knife and a poor cutting board, then you know why spending a little more goes a long way. Craving more simple superfood salads made with beans and pulses? Check out our Black Bean Corn Farro Salad and Easy Lentil Salad with Asparagus and Sun-Dried Tomato recipes, both use lentils and beans as their base and are great for lunch leftovers throughout the week. Did you make this Mexican Three Bean Salad? Leave a comment below and rate the recipe to let us know how it turned out. Save this bean salad recipe for later by pinning to your favorite salad Pinterest board and make sure to tag me on the Fork in the Road Instagram to show me your bean salad creations! To make dressing: blend or whisk together olive oil, lime juice, garlic, cumin, pepper, salt, and chili powder. To make salad: Mix together beans, peppers, onion, corn, avocado, and cilantro with dressing. Serve immediately or chill in refrigerator to serve cold. This recipe was slightly adapted from AllRecipe’s Mexican Bean Salad. Try adding avocado after other ingredients have mixed if you don’t want a mushier avocado-type dressing on salad. Add sooner will mix avocado in with other veggies (which we like), but if you want your avocado in fuller pieces then add after other ingredients have been mixed. Leftovers & Storage: This Mexican Three Bean Salad can be stored in an airtight container in the refrigerator for up to five days and served immediately chilled or heated. Nutrition: This simple bean salad is vegan, gluten-free, and a great choice as a main or a side dish. It is high in fiber, high in healthy fats, low in sugar, a good source of plant-based proteins, and cholesterol free. It is also an excellent source of vitamin C and a good source of iron, which is a nutrient of concern for those following a plant-based diet. I love easy salads for Sunday meal prep and this looks like the perfect addition to my usual recipe rotation. Thanks for the recipe inspiration! I’m glad you liked it! Yes, it has fast become one of our favorite new meals to make for lunches. We make a big batch once a week and eat it for lunch for the next few days. Makes weeknights that much easier. Enjoy! I’m so happy you enjoyed it! I’ll let my husband know, this was his creation and he makes it at least once a week. Thanks for stopping by and leaving a rating!